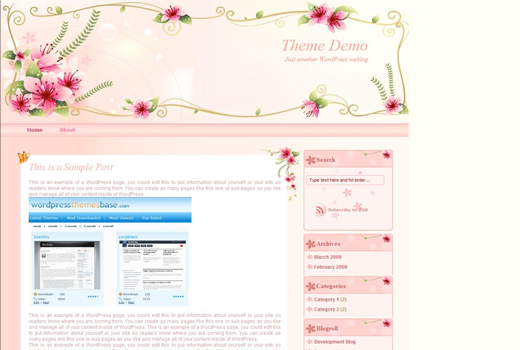 Girly Diaries blogger template for free download on Blogger Templates. Can I know where is the blog code.I like this templates very much. Have you downloaded the template? After you have downloaded it, unzipped it and in the folder you can see GirlyDiaries.xml. Upload that file to blogger and your good to go. I Copied and pasted the code to my eblogger but it doesn’t work. OOps, nevermind. I found it. LOL! I had placed it in the wrong place. Awesome tmeplate, so beautiful! Thanks so much! I am sure you can do that if you go to Edit HTML and look for the font and text that you want to change the colors and change it from there. You need to be able to find which one you want to change as well as some HTML to change it though. Ok Carol, did a bit of search for you. Change #333 to a darker html color that you want, you can give #066 (darker pink) a try. Let me know if it works for you thanks! why i cannot open the xml folder? Have you unzipped the downloaded file yet? If not, google free winrar or 7zip and unzip the downloaded folder then you will be able to open the folder. can u email me the code…? Perhaps your IE isnt working well. Why do you need to open the file anyway? You can simply upload the template file to your blog and make any code changes from there. I have tried to make the fonts larger as well as darker by following your advise a few post up but it doesnt seem to be working. I changed the color in the HTML editor as well as the font and color editor. It shows the changes there, but not on the blog. Any ideas why? There is another way. Each time you make a blog post, there is an option in blogger to adjust the default text size to larger, do you see it? I’ll go check it out. Is there another way to make the font darker too? Thanks BTW! Hi, I think I’m a bit slow when it comes to this cos I just can’t for the life of me figure out how to upload the unzipped! I double-click on it and I get a page that says “The XML page cannot be displayed”. What do I do?! Can’t change the text color Tried everything! I changed the 333 to 066, but nothing works. Any tips or hints as to what I am doing wrong? Thanks! Try changing this to the color you want, I am not sure if this is the correct one its my guess. Hello, how to move the home tab inside the center column? Its being outside the column. And how to replace the comment, RSS tab ? I want to put ” about” tab etc instead of “comment” and “edit”. Pls help, thanks for your advance. I am seeing the Home tab inside the menu bar, not sure what you are seeing, perhaps you can place a link to your blog in the website field of the comment box. Where do you want to put the about tab and rss tab, which part o the template? Please, can someone just send me the code? I’ve tried for a few hours now and its not working. Im going crazy! my question is this code to make the color of the text become more darker? i change it to any color, it seems none of it is working. i try also to change the default textcolor at variable. same also result which is not change either. can you help us! Hihi, I love this template too!!! But this morning, went in to view from IE, all the headers/side images are gone! But when I view from my blackberry, it was ok … do I have to host my own images? We have had some hardware failure, we just bought the new hardware, images should be up soon. Sorry for the inconvenience. Im having some problem with this template. In layout, my blog post is coming twice. Whatever i post, it comes twice. Its occurring since ive uploaded this beautiful template. Can u tell me how to solve it? Because i really want to keep this template. Farzana, thats strange..no one had this error before. Did you accidentally posted twice? i alredy did it.delete some html code.now its ok. 1.) The SEARCH widget does not have a search bar in it. I tried to remove it through editing and that is not an option. It looks more like the TEXT widget and I don’t know how to fix that. 2.) I’d like to have a tab for each of my post labels next to “home” and not the “comment,” “RSS,” or “edit” tabs. But when I go to the dashboard on blogger to edit the layout, I seem to have no access to edit these tabs. I don’t even know what RSS is ( and I don’t think the readers need to see the edit tab up there since I’m the only one that can edit anything…If you could help me figure out how to change these tabs, I’d so appreciate it! Thank you! awesome , now i’m using . Is the “Girly Diaries” template not available anymore? I can’t seem to find the download link. OH gosh never mind, I see the big red download button now, LOL I thought that button was part of the advertisement until I click it on it. Thank you for sharing such lovely templates. Can you please send me the html for me to copy and paste? I can’t seem to find the button to upload the file on the bloggers template page. Thank you. Are you using Blogger Classic or XML version? After you unzip the file using winzip you need to go to Blogger Dashboard -> Layout -> Edit HTML and upload GirlyDiaries.xml without having to open the file. This tmeplate only works on the latest Blogger XML, it does not work on the Classic HTML blogger. I have a problem with posting a comment with this template. When I post the comment, they ask for word verification, but I can not type in the word verification. In another word, it seems not enough space for post the comment space and when the word verification comes up, it does not show entire space…hope you understand what I was trying to say. How can I change the space of the posting area?? I would like to center this theme. It is aligned left, but I need it be centered. Admin, I need your help. I’d like to have a tab for each of my post labels next to “home” and not the “comment,” “RSS,” or “edit” tabs. However, when I try to edit the layout, I seem to have no access to edit those tabs. I really don’t want my ‘visitors’ to see those tabs. I’d really appreciate it if you could help me figure out how to change these tabs. I have the same problem as Nea, I would like to change “Posts RSS”, “comment”, “edit” tabs but not able to do so. Also, can I add a picture to the header part rather than have words? How do I do that? Yesterday i did the download of this template and after add to my blog the pics that i have (and are very big) are going to the menus (blog archieves, my blogroll and etc). Also i dont have the option to older posts, can you help me, please? I am afraid you may need to scale down the pictures size as this template body width is not big enough neither can it be adjusted to fit your pictures in it as it’s about the maximum width it can go. Ok to the pics, that i can change.. but and about the link to the older posts? i had it before in my old template. At the end of the first page you could click in ‘older post’ and see all. Now the only option is looking in blog archieves. Help me please.. otherwise i will need to change the template again and i really liked this one. Please put your website into the url of the comment box else I can’t look at your site to figure out the code for it. Are you really not able to work without the Older post code? Most bloggers are fine without it though I am sure there are other templates here that has the Older Post code. Is there anyway I could edit those “home”, “RSS” tabs? It’s okay if I couldn’t delete those tabs. But I just want to have tabs for my posts and gadgets next to “home”, “RSS” tabs. oh and is it possible to change this template to 3 columns? How did you upload the template? Did you unzip the downloaded file here first then go to blogger dashboard -> Edit HTML and upload the GirlyDiaries.xml file via the upload box there? I really love this theme. But there is no link to see older post.. Is this something that can be easily fixed???? Why doesn’t it have a code? how do i put it in my layout blogger? How do I get this onto my blog? can somenone please tell me how can i put it in the column pls? hi i love this template alot. downloaded it but i jus cannot open e XML. it simply will not load. pls advise. would really love to have this for my blogshop. love it max! I love this design, would love to use it; but I’ve unzipped the download, adn try to open the xml file; but it just tries to open internet explorer and nothing happens. I don’t see a place anywhere on blogger where I can ‘upload” a file for the template design and I can’t find any HTML in the unzipped file to copy/paste it directly into the HTML of my blog. how can I upload it?? ?